For centuries, pipe organs stood at the summit of musical and technological achievement, admired as the most complex and intricate mechanisms the human race had yet devised. In All The Stops, New York Times journalist Craig Whitney journeys through the history of the American pipe organ and brings to life the curious characters who have devoted their lives to its music. From the mid-19th to the mid-20th century, organ music was wildly popular in America. Organ builders in New York and New England could hardly fill the huge demand for both concert hall and home organs. Master organbuilders found ingenious ways of using electricity to make them sound like orchestras. Organ players developed cult followings and bitter rivalries. One movement arose to restore to American organs the clarity and precision that baroque organs had in centuries past, while another took electronic organs to the rock concert halls, where younger listeners could be found. But while organbuilders and organists were fighting with each other, popular audiences lost interest in the organ. Today, organs are beginning to make a comeback in concert halls and churches across America. 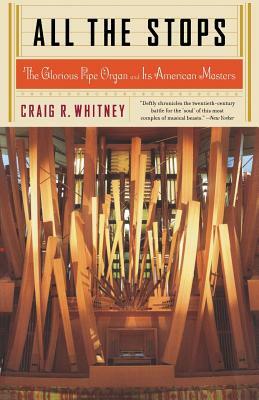 Craig Whitney brings the story to life and up to date in a humorous, engaging book about the instruments and vivid personalities that inspired his lifelong passion: the great art of the majestic pipe organ. Craig R. Whitney has worked as reporter and foreign correspondent for the New York Times in New York, Saigon, Bonn, Moscow, Paris, and London. He has also served as European diplomatic correspondent, foreign editor, and Washington editor. He is currently Assistant Managing Editor of the Times. An amateur organist, he has played on and written about pipe organs around the world.